A biologist, Kaisha Atakhanova successfully challenged a government plan to import and store foreign radioactive waste in Kazakhstan. Kaisha Atakhanova led a campaign to prevent nuclear waste from being commercially imported into the Republic of Kazakhstan. A biologist specializing in the genetic effects of nuclear radiation, Atakhanova founded and directs the Karaganda Ecological Center (known as EcoCenter), which promotes grassroots democracy-building and environmental protection within government and civil society. The entire Central Asian Republic of Kazakhstan is highly polluted by nuclear contamination, a 40-year legacy it inherited from Soviet rule. Nuclear testing equal to the explosion of 20,000 Hiroshima bombs was conducted there and the resulting radiation contaminated the country’s crops, land and livestock, and caused severe health problems among local people. Kazakhstan houses 237 million tons of radioactive waste at more than 500 locations that await safe disposal. Experts say that nearly one of every 10 Kazakh citizens is directly affected by the Soviet nuclear legacy. In June 2001, KazAtomProm, the commercial branch of the Kazakh State Committee on Nuclear Energy, quietly introduced legislation to allow nuclear waste to be imported commercially and disposed of in Kazakhstan. The move directly challenged existing legislation outlawing such importation. The money, potentially in the billions, would be used to help Kazakhstan deal with its own nuclear waste problems, proponents said. When news of the KazAtomProm plan was leaked to the public, Atakhanova organized a meeting of NGO leaders to discuss how to wage a campaign against the legislation. Fifteen organizations formed a steering committee to reach out to other NGOs across the country and build a campaign against the proposed change in law. Eventually 60 NGOs joined the grassroots network and challenged the assertion that nuclear waste importation would generate large revenues for the country. Their argument was threefold: Kazakhstan is a country rich in oil, gas and other natural resources, which precludes the need to raise money by importing radioactive waste; increased nuclear contamination would deter international tourists from traveling to the country; and, because corruption in Kazakhstan is rampant, there would be no guarantees about how the revenues would be spent. Learning that the vote was scheduled for January 2003, Atakhanova helped develop a New Year’s letter that was sent to all Parliament members via registered mail, asking them to state their intended vote on the issue. Atakhanova exposed the votes of the ministers and ultimately influenced them to declare that they would not pursue the importation of nuclear waste. At almost the same time, the Kazakh Parliament proposed legislation that would weaken civil society organizations and limit their ability to organize against the government. Atakhanova and her colleagues lobbied against it, and the president withdrew the legislation from consideration in October 2003. As a result of Atakhanova’s efforts, the nuclear waste legislation not only was stopped, but the visibility of nuclear contamination issues reached new heights across the country. The budding grassroots civil society movement asserted its right and ability to challenge government’s anti-democratic interests in an entirely new way. In addition, under Atakhanova’s leadership, EcoCenter has helped develop an environmental movement through EcoForum, a network of more than 100 NGOs nationwide. Kaisha Atakhanova, 2005 Goldman Prize winner receiving her award from founder, Richard Goldman. Kaisha Atakhanova, accepting her award at the 2005 Goldman Prize ceremony. Kaisha Atakhanova with petition for nuclear rights. Kaisha Atakhanova, 2005 Goldman Environmental Prize Winner, Asia (Kazakhstan), at a memorial to nuclear victims called, "Stronger than Death." 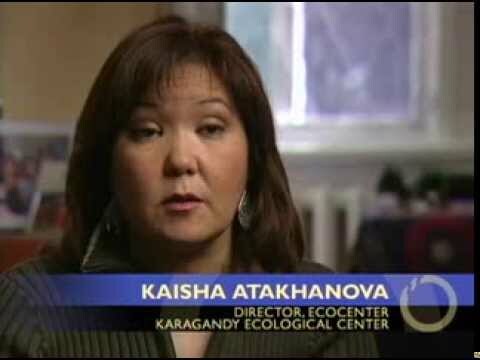 Kaisha Atakhanova, 2005 Goldman Environmental Prize Winner, Asia (Kazakhstan).